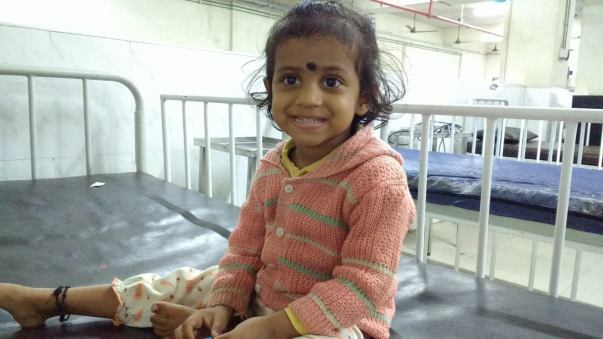 2 ½-year-old Divya is in a situation that nobody wishes upon such a young baby girl. She's been diagnosed with a rare form of blood cancer, and alienated by both her parents during the time she needs them most. Your support could make a world of a difference to this little young life. Coming from Kattupakkam, near Iyappanthangal, Divya's parents Tamilselvi and Lakshmipathy run a small shop where they iron clothes for a living. The father is not dependable and doesn't support the family right now. As for the mother, she developed post partum psychosis (a rare form of psychiatric illness that sets in suddenly after delivery) after giving birth to a second child, which got worse after losing the child to an infection. 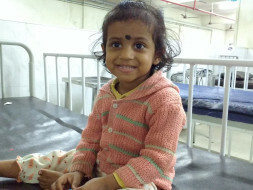 She hasn't been able to deal with Divya's diagnosis and is currently under treatment. "She is too young to understand what's going on around her. All she knows is we are going to the hospital and back home. She is getting injections. Small things. But yes, it is difficult when her mother isn't around." "Two months ago, it began with a fever and suddenly Divya was not able to walk." The diagnostic tests revealed that she had Acute Lymphoblastic Leukemia. It sent the family's world spinning especially after the pain of losing a child and Tamilselvi's depression. Still, they focussed their efforts on getting this baby girl to brave this disease and fight through. 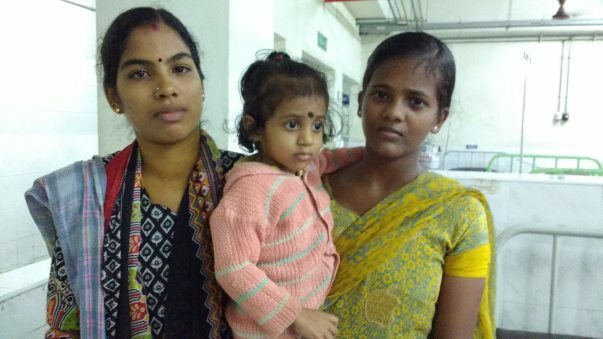 Baby Divya needs chemotherapy and additional treatment for a period of 2 years. "She has not responded well to initial treatment, the numbers are low. So the doctors have told us we need to start with aggressive chemo right away." Now this little girl is being taken care of her grandmother (Vitta Bai), maternal uncle (Shiva), aunt (Tamilselvi) and maternal aunt's daughter (Bavani). The grandmother works as a maid, while most of the family iron clothes for a living. They are unable to afford even the subsidized costs due to their economic background. 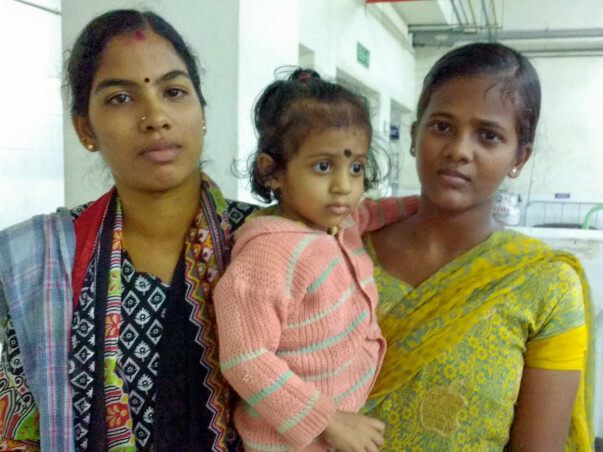 Treatment to save Baby Divya is estimated to cost Rs. 2.50 Lakhs. Your support can make this battle less lonely to this little toddler. All the specifics of this case have been verified with the concerned hospital. For more details, please contact the campaign organizer. Divya is presently in the hospital undergoing her chemotherapy. She will soon undergo the liver transplant as well. We will let you know the donor once the same has been decided. Will keep you posted. Thank you all for the constant love and support! 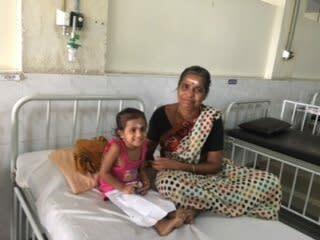 Divya is presently in the hospital undergoing her maintenance chemotherapy and doing well. 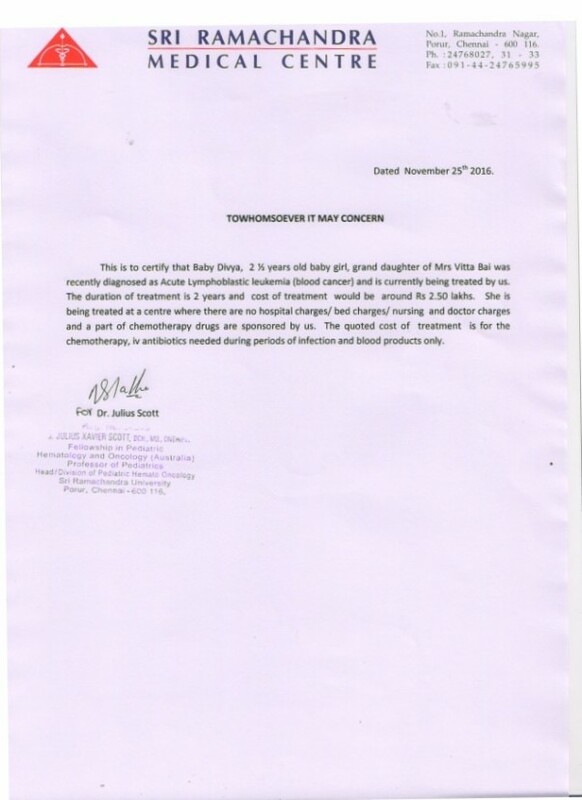 Divya is fine and entering the intensive phase of treatment for a period of 2 months after 2 weeks. After the intensive phase, she has to undergo a blood test to assess her exact status. 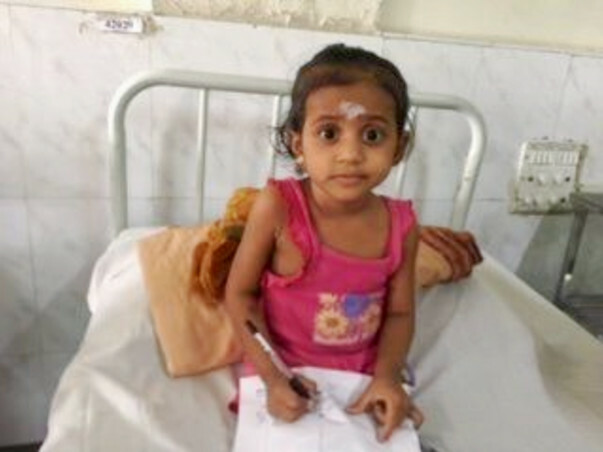 Our heartfelt thanks to all the donors for supporting this child's treatment. Divya has completed 2 months of chemotherapy. She developed intolerance to her drugs in the third month of chemotherapy and required a prolonged hospital stay. But with the prayers and wishes of all her donors, she recovered without any complications . The grand mother thanks us every time and in turn we tell her that is the unknown faces of so many to whom she is actually indebted to.